We won't know if Mastermind's a masterpiece until it's released on March 4, but Rick Ross made a strong case for the record with an intense performance on The Tonight Show starring Jimmy Fallon. Here, Rick Ross offered an excellent rendition of lead single "The Devil is a Lie." It helped that house band the Roots were involved, adding an extra layer of intensity to the percussive, horn-heavy beat, ultimately breathing new life into the song. 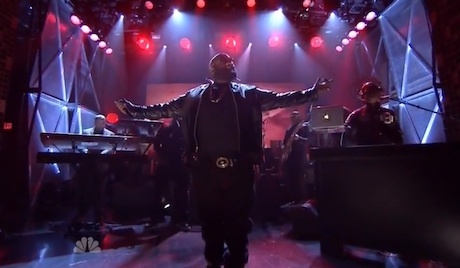 Watch Rick Ross perform "The Devil is a Lie" on The Tonight Show below. Read an interview with Rick Ross about the making of Mastermind here.